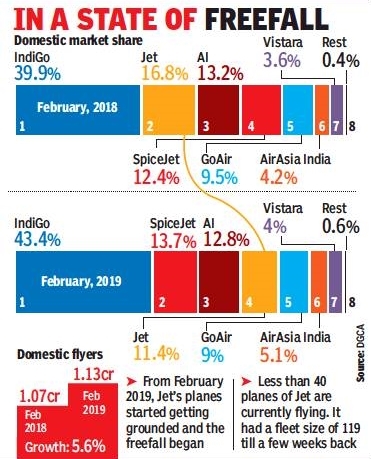 From being the second largest domestic airline for years, Jet Airways officially slipped to the fourth slot in February due to its cash problems, with SpiceJet and Air India overtaking it. With bank accounts running empty, Jet’s fleet is now down to 41 from 119 as unpaid aircraft lessors started repossessing their planes. With the fleet size expected to drop to 35 in next few days, market players expect the airline to close the financial year with a single digit market share. 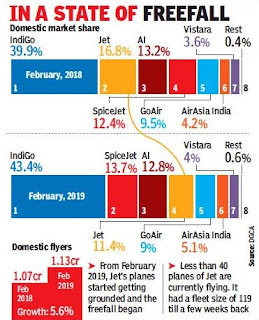 Airlines with lower domestic market share in February — GoAir and Vistara — have firm orders for planes and AirAsia India is also expected to do the same. Jet, on the other hand, faces an uncertain future. While IndiGo became the domestic market leader by a huge margin, Jet in last few years — especially after its tie-up with Etihad in 2013 — focused on international expansion. The Jet-Etihad combine was the market leader in terms of flying people in and out of India. But Jet’s financial crunch since February has led to grounding of both narrow and wide body planes, impacting its international traffic too. The government is now looking at giving Jet’s unutilised slots to other airlines, which have been asked to add up to 25 planes by next month to tide over the sudden crunch caused by Jet. The DGCA is finalising summer schedule, which will be effective month-end, without considering the schedule given by Jet.